Roughtrax 4x4 approached us for a complete re-build of their existing ecommerce website, they wanted a modern website with new functionality whilst maintaining their existing product, order & customer data & keeping to their core business objectives. We recommended building a responsive website using Magento ecommerce platform, ensuring their new ecommerce website would work seamlessly across mobile, tablet and desktop devices. We worked closely with Roughtrax to ensure we understood their business processes, objectives and goals. We undertook a wireframing workshop with them to define the structure, content and functionality of the new website. The focus in our wireframe workshop was search engines (attracting customers) brand (looking good) and conversions (turning visitors into customers). Our experienced web designers used the wireframes to produce a bold, fresh new look. We undertook a complete re-branded for Roughtrax, providing a new colour scheme, fonts and logo. Using the new design our experienced Magento developers hand built a bespoke responsive Magento theme. We added in additional bespoke functionality and tested the website to ensure it worked across multiple web browsers and devices. 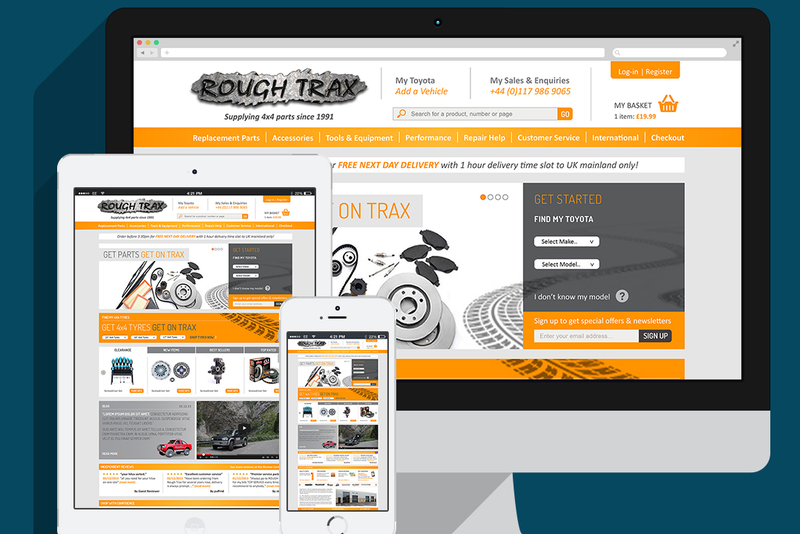 Roughtrax's new website was built using Magento's ecommerce platform. At the time of the build Magento 1 was available. We manage and maintain their Magento extensions as well as applying security patches and upgrades when they become available. Roughtrax wanted to maintain the data from their legacy website as it contained product, order and customer data. The legacy websites database did not match the structure of their new Magento database. We had to extract the data from their legacy website and write custom scripts to import the data into their new Magento database. With the launch of Magento 2 & it's new features we recommend Roughtrax migrated over to Magento's new ecommerce platform. We undertook the migration of the data from their Magento 1 database to their new Magento 2 database. We also migrated their Magento 1 theme over to their new Magento 2 website. Roughtrax wanted to have a blog section to offer help, advice & support to their customers. As Wordpress experts we recommended it and we integrated their Mangento Ecommerce website and Wordpress website together so their customers didn't know the difference between the two websites. We recommended Roughtrax used Sage Pay as their payment provider. As a Sage Pay partner we have years of experience using their system and we easily integrated it into their new ecommerce website. We also recommended using PayPal as another payment option. We integrated Roughtrax's website with their Sage Accounts system, passing across their customer and order details. Saving their accounts department endless hours of work. We integrated Royal Mail, DPD & DHL couriers into Roughtrax's new Magento ecommerce website. This allows them to offer multiple shipping options and provide competitive shipping costs to their customers. As Mailchimp experts we recommended Roughtrax used it for their newsletter signup option on their website. We also setup Mailchimp to send automated product follow up emails, back in stock notifications and abandoned basket emails. We integrated Roughtrax's website with a SMS service so they could provide order updates to their customers via txt message. It also allows inbound messaging so their customers can txt them for help and advice. We provided advice on setting up Roughtrax's YouTube community. We also integrated YouTube videos into their ecommerce website, displaying videos on their product pages as well as their blog for their 'how to' and 'help' articles. Rougtrax's new ecommerce website was deployed to a dedicated custom built cloud server. We manage and maintain the server, applying security patches and updates when required as well as routine server maintenance. We setup, manage and maintain Roughtrax's email accounts through Rackspace, as a Racksapce partner we have an in-depth knowledge of their cloud hosting and email products. We ensure Roughtrax's website is backed up daily, including onsite and offsite backups. We have never had to use them but it's good practice to have them just in case. We use onsite and offsite software to monitor Roughtrax's website 24/7 as well as transactional monitoring and we are alerted if there are any issues. We achieve a website load time of less than 2 seconds per page and we have an 99.9% uptime rate. On behalf of Roughtrax we manage the purchase & renewal of their domain names. We manage and maintain Roughtrax's DNS records. We also implemented a DNS backup solution for Roughtrax through Amazon Web Services in case of failure ensuring their website and email are always available to them and their customers. We recommended Roughtrax have an SSL certificate installed on their website, this would ensure their customers data is encrypted and secure when they entered their personal information into the website. There is also an SEO benefit. We manage the purchase, installation and renewal of their SSL certificate. We setup Roughtrax's Google Analytics account and added their tracking code to the website. We ensured their account was setup for ecommerce tracking and we added their goals so they could track conversions. We also added Adwords & Facebook remarketing code to their website. We setup Roughtrax's Google Webmaster Tools account & we manage their 404's, structured data & sitemap submission. We provide ongoing advice and support to Roughtrax, often being their first point on contact for anything technical or web related. It has a bold, fresh new look with a complete re-brand of logo, colour scheme, enhanced navigation experience as well as excellent new features. If you are looking for a ecommerce web design & web development agency to help you with your next web project, give us a call and have a chat with us. We have over 17 years of experience designing and building sucessful websites, mobile apps & web applications. We offer free no obligation quotes. Alternatively, please use the form below to contact us. We will get back to you within 24 hours. The fields below marked with * are required.